Attendance on Demand... Tell me more! Attendance on Demand is a time and attendance service that calculates hourly or salaried wages, manages employee time and wage data, and meets the needs of any sized organization. It combines the convenience of online access with the familiarity of a conventional wall-mounted time clock and PC for time data collection. Our service is entirely online, so there's no software to buy, install, or upgrade. 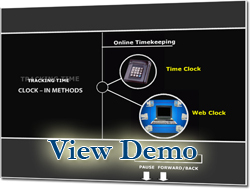 The SecuredClock solution defines practicality in today's timekeeping industry. Our TimeClock™ is easy to set up - just plug it in and begin punching. It's also easy to use - simply punch in and out with the push of a button, swipe of a card, through a finger verification scan, or online through your PC.